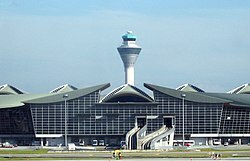 Kuala Lumpur International Airport (KLIA) (IATA: KUL, ICAO: WMKK) is Malaysia's main international airport and a Southeast Asian airport. It was built at US$3.5 billion in Sepang district of Selangor. It is located approximately 45 kilometres (28 mi) from Kuala Lumpur and serves the Greater Klang Valley conurbation. It is the major hub of Malaysia Airlines, MASkargo, AirAsia, AirAsia X, Malindo Air and Department of Civil Aviation (DCA). ↑ "AirAsia X to fly to Narita 4 times a week". themalaymailonline.com. ↑ "Iraqi Airways Kuala Lumpur Operation Changes from late-July 2014". airlineroute.net. ↑ "Malaysia Airlines Plans to Move Dubai Operation to Al Maktoum May – July 2014". airlineroute.net. This page was last changed on 6 February 2015, at 14:41.